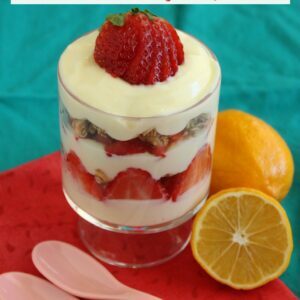 This Meyer Lemon and Strawberry Parfait is an easy and delicious breakfast that's the perfect way to start your day! In a small bowl, mix the lemon curd and Greek yogurt together. Using a parfait glass or bowl and layer the lemon/yogurt mixture with the Granola and Strawberries, beginning and ending with the yogurt mix. Keep refrigerated if not eating immediately. Can be refrigerated up to 8 hours, but the granola might not be as crunch. Enjoy!